Your site will load fast and look good on most browsers and modern computers, tablets and smartphones. Why we develop websites on WordPress! WordPress provides the best options for optimising your posts, pages and images to be search engine friendly. Google gives preference to mobile-friendly sites. The built-in content management system makes it simpler for you to learn how to add or update your own content, videos and images if you wish. The user-friendly nature of WordPress allows it to be highly customisable. We can match your website to the look and feel of your business. 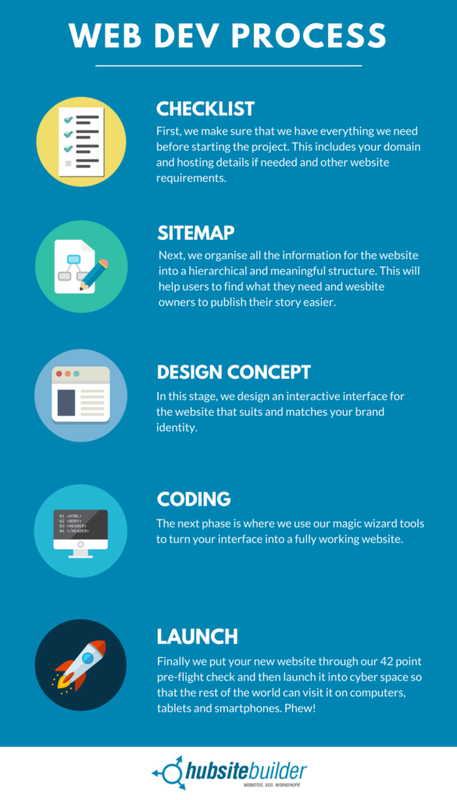 As you can see in the infographic above, we have a well-defined process that allows you and our team to be clear about exactly what stage of the website development process we're up to. We start with a checklist of all the logins we will need. Next, we develop a sitemap. This shows where all the working parts of your website fit together. After that, we reveal the design concept. This will complement your business's visual assets - logo, colours, font styles etc. When you have approved the design concept we get stuck into coding to bring your site to life. Finally, we launch your new site! During the process, you will be taken care of by our friendly project manager while your website takes shape and develops functionality! We love to work with clients who are excited, passionate and positive about growing their business online. Before we even think about starting, here's what we need from you if you want to work with us.